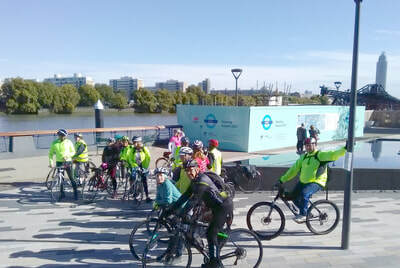 A dry, part sunny, morning with 21 riders at Peckham Square. 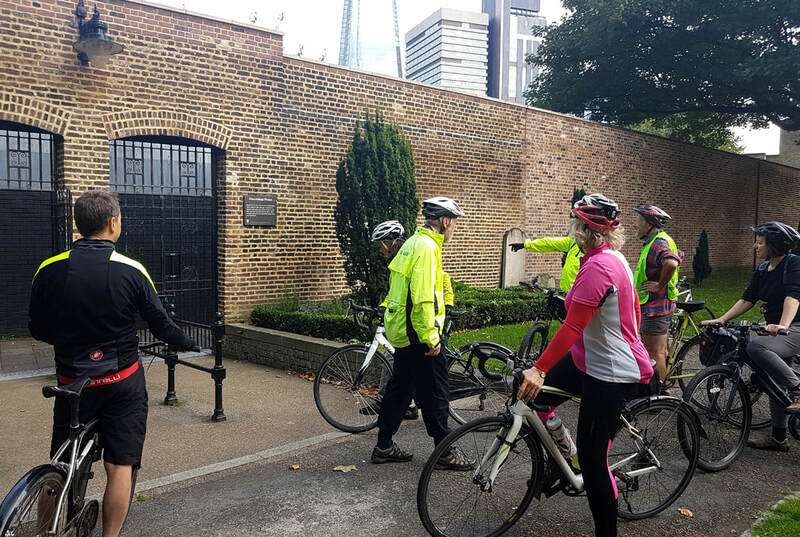 Full report at https://southwarkcyclists.org.uk/three-prisons-and-a-ferrymans-seat-healthy-ride-sept-23rd-2017/ Track at www.mapmyride.com/routes/view/1760844296 Photos below. Detailed information about the prisons and the seat are in the document on the right. "+" Ride. 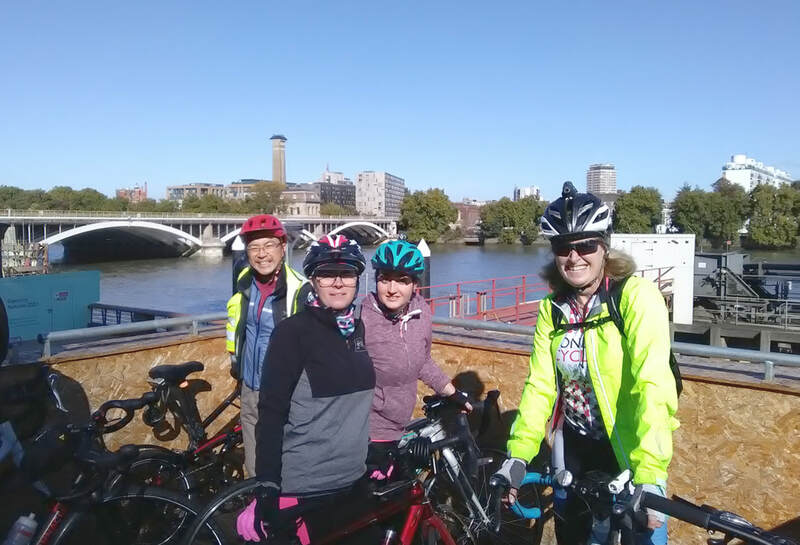 Cutty Sark to Lesnes Abbey. 16 riders headed off from Greenwich central along the Thames Path in dry, cloudy weather. Cut across the north Greenwich peninsula over the blue pedestrian bridge then picked up the Thames Path again at the Ecology Park. Followed the river past the Flood Barrier then headed inland to the Thamesmead Ridgeway. 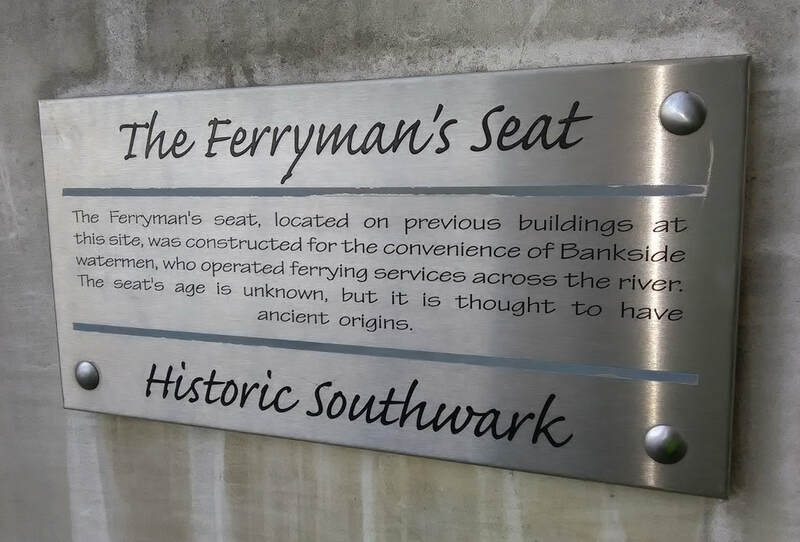 This has been resurfaced, and the new tarmac Bexley section is great. Reached our coffee stop at Lesnes Abbey Park at 10.45 - really good time. So a long coffee break had been earned. The Coffee Shop was pleased to see us and we were all given loyalty cards with one stamp on them! Headed from the Abbey directly to the riverside path so we had a long run along this to Woolwich, then the flood barrier again, then all the way round the North Greenwich peninsula past the O2. 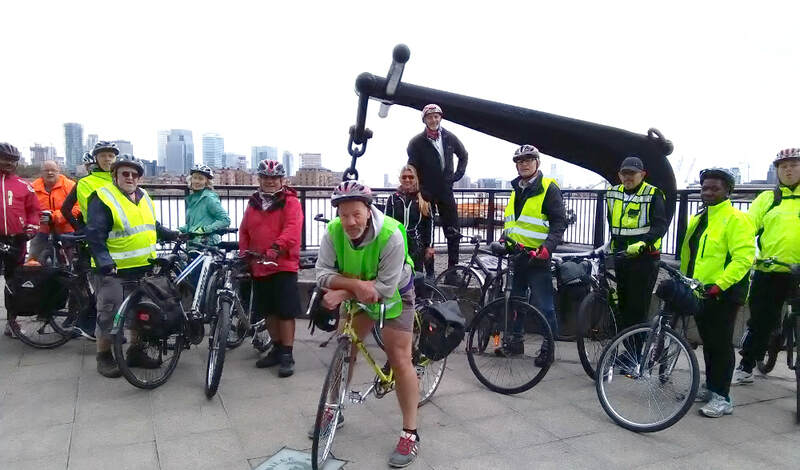 Continued on the path back to Cutty Sark, apart from the short stretch around Enderby Wharf. Really excellent route designed by Amanda (who led) with help from Philippa. Route track in pdf file on right. Riders paused on the Greenwich riverside. Looking across to Millwall riverside where boats for Gt River Race were waiting to start. Continuing our National Route 21 theme from the last 2 rides, this ride headed for the north-most section. 17 riders, including 2 very young ones, headed off from Canada Water, and another 3 riders were collected en route. Reasonable weather with some sun about. Headed across Southwark Park, then over to Deptford Park and Folkstone Gardens. From there the Deptford paths, across the A2 and on to Brookmill Park. 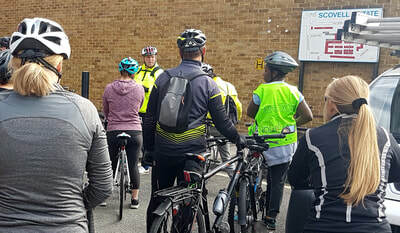 Picked up National Route 21 and headed South past the Lewisham Leisure Centre to the end of the off road section at Elmira St. Next back to the Lewisham Leisure Centre for a short break. 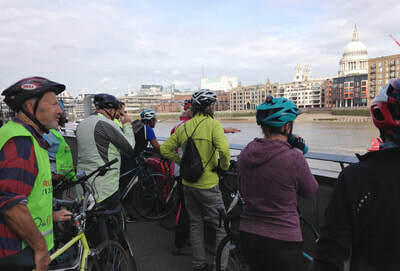 Then continued down NR21, through Brookmill Park again and continuing to the Thames at Deptford Creek. Finally Thames path and Greenland Dock back to Canada Water. Stopped on the Deptford riverside to watch preparations for the Great River Race. Lots of small boats getting ready to race up with the incoming tide to Ham house in Richmond. Route at https://goo.gl/w4LBUR or gpx below. 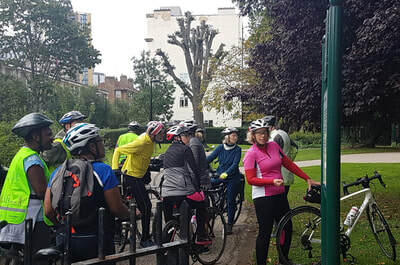 28 riders at the Pavilion Cafe, Dulwich Park on a lovely sunny morning. This is the best turnout ever for a Dulwich ride. The aim was to get to Cator Park. However a broken chain caused a long delay so it was decided to head straight to Lower Sydenham from Sydenham Station. 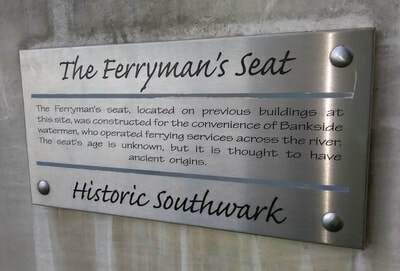 This meant we had plenty of time to enjoy the nice stretch of the Waterlink Way (NR21) nearly to Catford. Had already decided not to return via Forest Hill, as planned. Lengthy perusal of contour maps had revealed that the climb from Honor Oak was easier, and this also avoided the steps at Forest Hill Station and the "kerbed off" right turn into Wood Vale south end. Beautiful day! 20 riders headed southeast on LCN22 route (planned to be upgraded as Quietway 83). 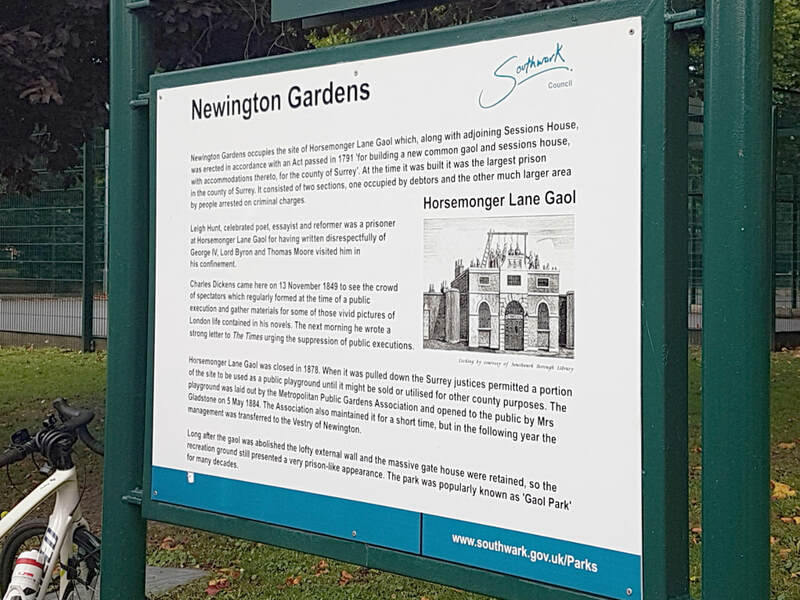 Up past Peckham Rye Park and Common on the east side, quiet streets to the cycle/pedestrian bridge near Camberwell New Cemetery, then Sevenoaks Rd to the south end of Ladywell Fields. At this point joined National Route 21, along which we headed south. This soon becomes the Waterlink Way, a delightful strip of green space that runs for 2km to Southend Lane in Lower Sydenham. Several riders had never been on this excellent cycle route, a nicely surfaced path, completely traffic free. And it looked great in the Summer sunshine. 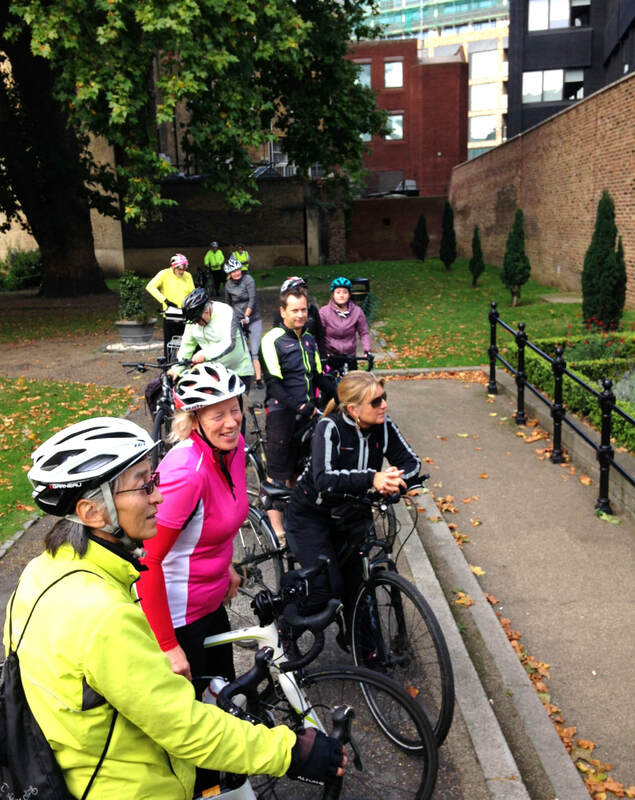 At Southend Lane we turned and enjoyed a return ride along the Waterlink Way, then continued on NR21 through Ladywell Fields. This is another 1.5km of well-maintained, traffic free, path. This stretch is enlivened by the "curly" rail bridge. The ramp does a tight circle and is challengingly narrow. 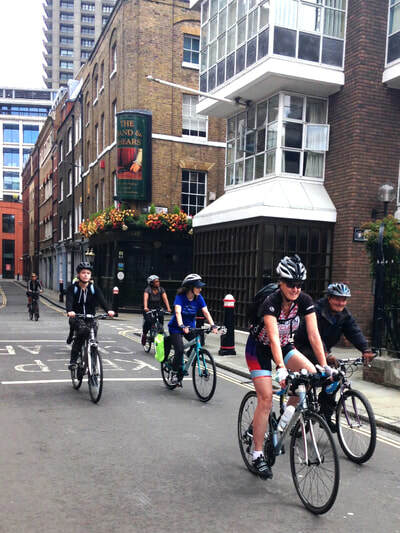 We sent the 4 youthful cyclists in the group off first and they all made it without putting a foot down. Several others also managed this. And the sensible ones just pushed their bikes up and over! Return route headed through Brockley and Ladywell Cemetery where we became hopelessly lost amongst the maze of paths. Following directions from a walker, eventually made it to Brockley Road. 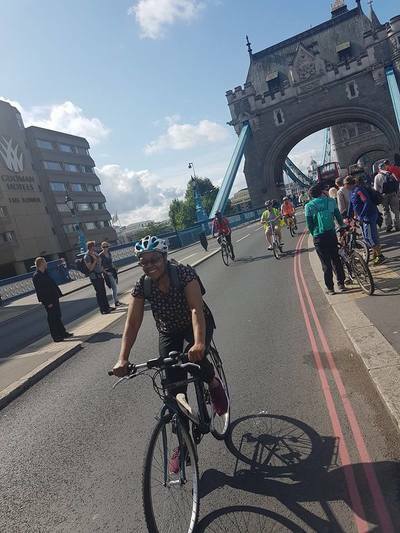 From there up to the pedestrian/cycle bridge across the railway at Turnham Rd, up the hill to St Asaph Rd and a fast run down into Peckham. Back bang on 12 noon with everyone looking much healthier. Route at https://goo.gl/vVDZud or gpx file on right. 27 riders at Canada Water including our youngest ever actually peddling on a bike. Her bike was hooked to her Dad's with the front wheel off the ground, but the back wheel riding the road. 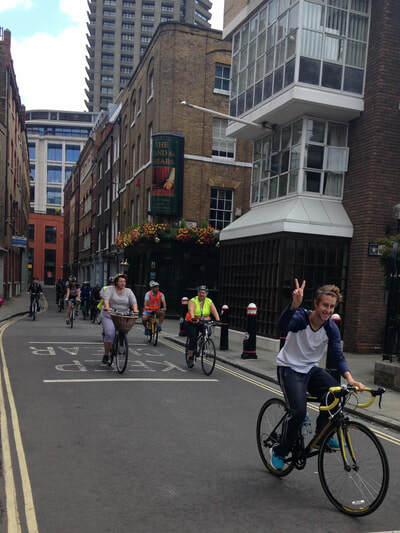 And this very young person was really peddling! 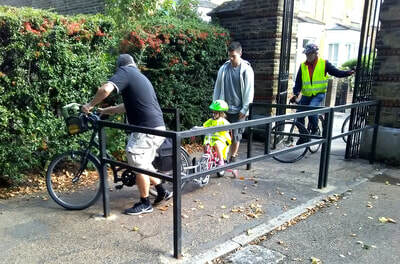 Was interested to see if this long double bike would get though the triple barrier at the Gomm St entrance to Southwark Park. 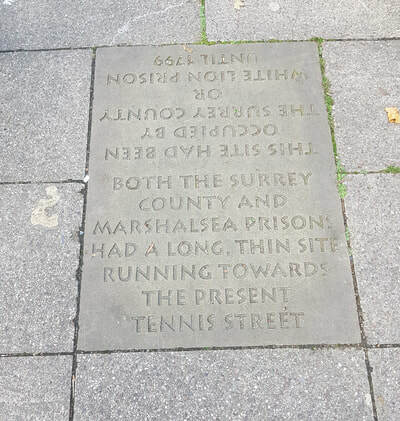 It did, with some assistance from a helpful pedestrian. 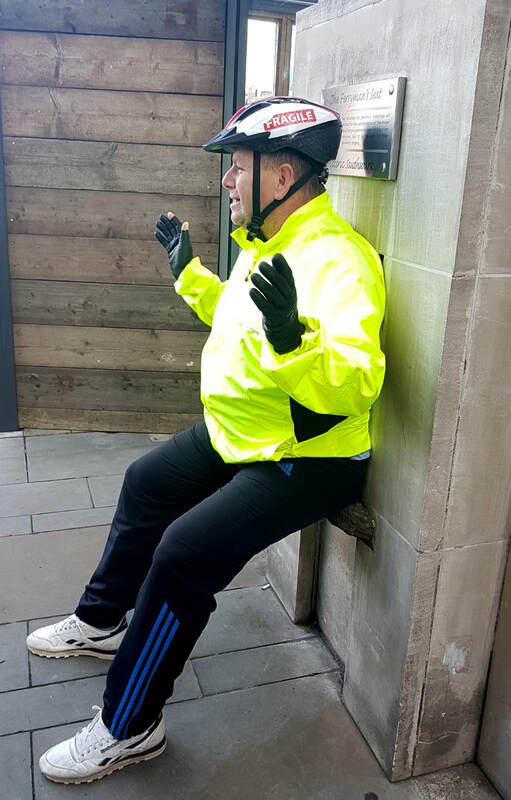 But I still think this barrier should go - no-one has justified its sudden appearance a year or so back without any consultation. In fact, why not open the large gates into the park a provide a welcoming entrance for all users. There is a traffic barrier just inside the gate, so keeping the gates closed serves no function except to discourage people from entering. 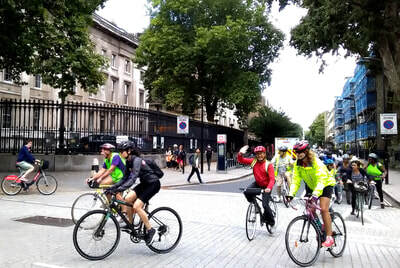 Took an quiet inland route to Waterloo Bridge, then across the bridge to Covent Garden and Leicester Square, Lots of tourists and other pedestrians, but really light motor traffic. Presumably this was because many of the locals are on holiday elsewhere. 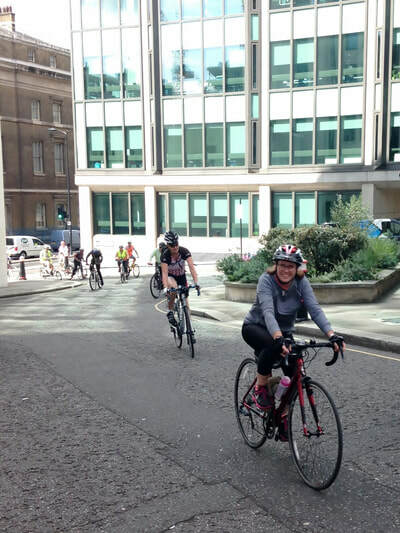 Continued through China Town and up Wardour Street, then past the Post Office Tower and into Regents Park. Arrived at our cafe break on Chester Road at 10.45, so could have a nice 25 min break. Started back at 11.15 minus our youngest rider. Her family decided to stop longer in the Park then make there own way back. 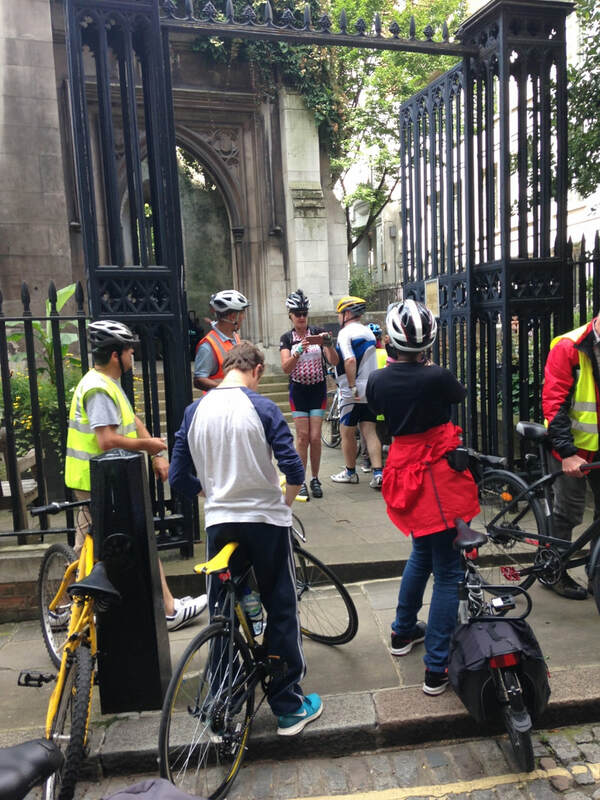 Our return route again took us across Bloomsbury, past the PO Tower and then the British Museum. 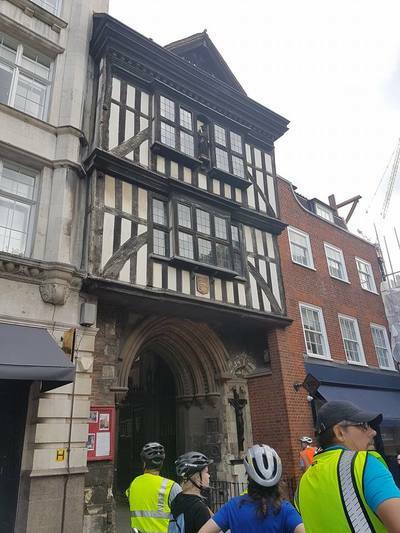 Then one of Werner's improbable routes through back alleys in the Temple, ending up miraculously on the E-W Cycle Superhighway. From there back by the obvious route over London Bridge along Thameside route (NR4). In such good time we could make a small detour past Surrey Water and to Stave Hill. Back at Canada Water at 12.55. GPX file of route below. Report from Harry who led the ride. 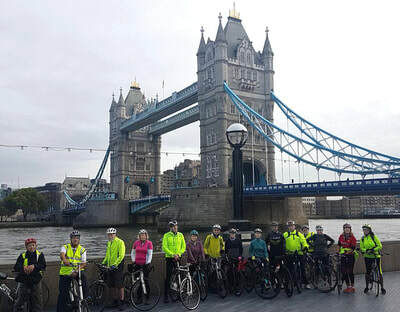 We set off from Canada water on a Sunny morning and headed along Albion Channel and onto Rotherhithe street, through to Dockhead and over Tower Bridge, picking up 4 additional riders on route making a total of 29 riders. 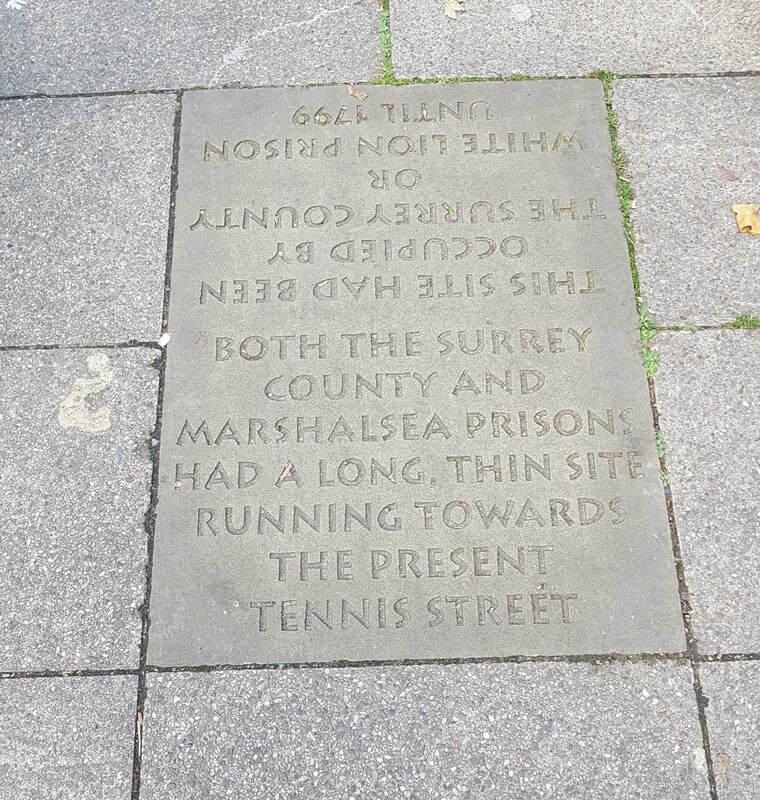 We made our way to Lower Thames street where the remains of St Dunstan of the East are situated, a very old church that was bombed in the Blitz and never refurbished, this is now a lovely garden. Stopped here briefly to have a quick look around and take some photographs. Then we made off along the cobbles to pick up the E-W Cycle Superhighway (CS3). We cut through towards the Guildhall making our way around the back past the Barbican and Beech street (through the Barbican tunnel) towards Smithfield. 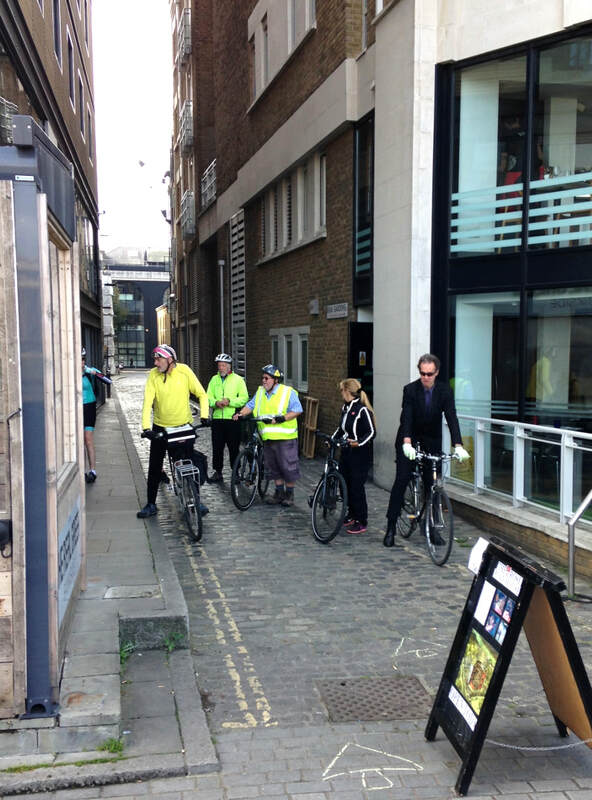 We then turned left into Cloth Street and then Right into Cloth Fair. Here we found the Oldest house in the city on the right opposite the Church (St Bartholomew the Great) . 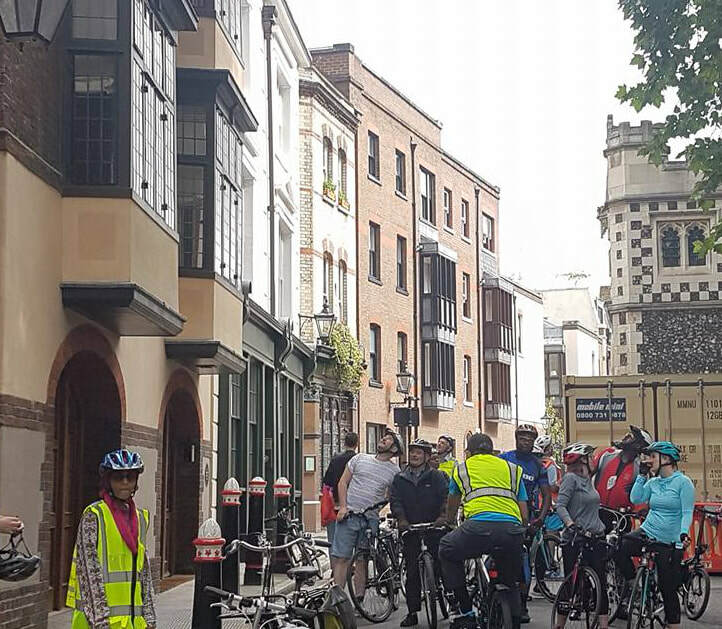 We stopped here to admire the house and the surroundings, and made our way to the front of St Barts church to view the grand entrance. 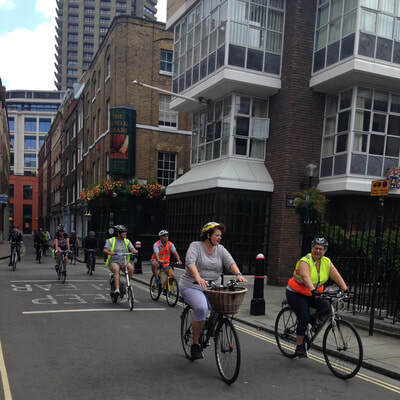 Headed back around West Smithfield picking up N-S Superhighway (CS6), making our way across Blackfriars Bridge and joining Quietway 1 (Q1) at Webber St. 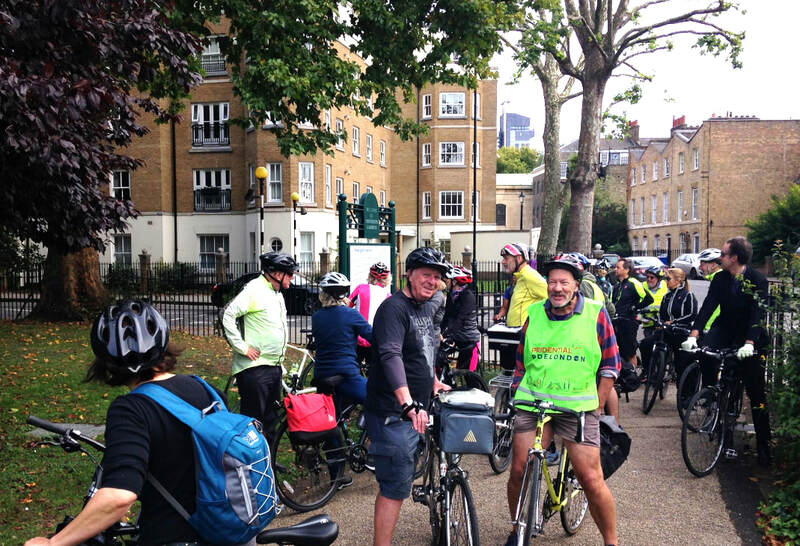 Eventually made our way to Southwark Park Road and into Southwark Park. There we had a brief mechanical as a chain came off. Finally back to Canada water reaching there at 12.05 after a total of 10.7 miles - and the sun was still shining. Many thanks to Amanda for doing a terrific job as back marker. 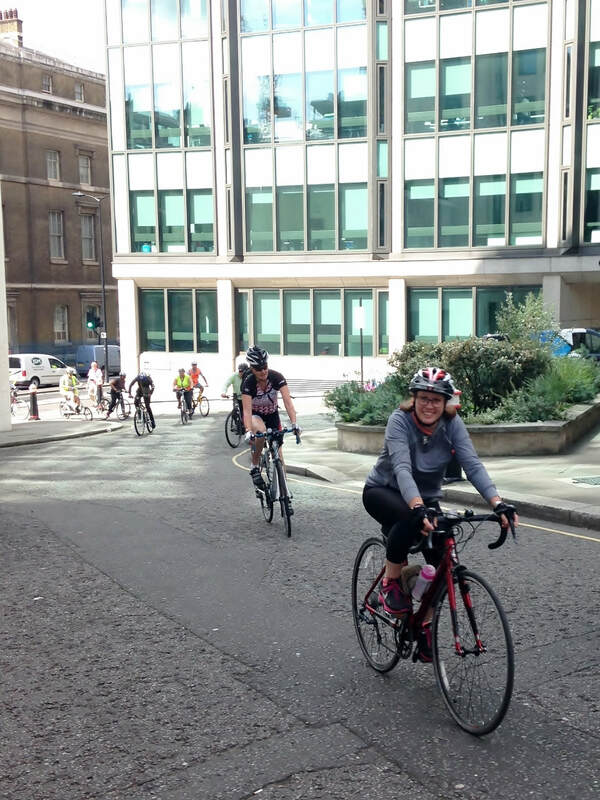 Report from ride leader Phillipa. "16 of us set off from Dulwich Park on a nice cycling day, warm but not too hot. We headed off first of all to Brockwell Park, low traffic levels made entering the park easy. 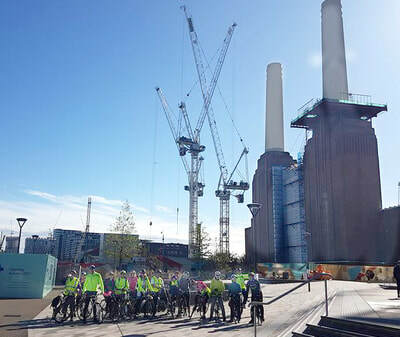 Round the park then off on LCN 25 to Clapham Common. We crossed the common and exited via traffic lights onto Nightingale Road then used quiet roads to reach Wandsworth Common. Then on to Tooting Bec via Balham. Across the common and under the railway line to weave around Streatham then back via Dulwich College and the cycle path into Dulwich Park. Perfect size group meant we had no problems with lights/traffic and everyone enjoyed the route. No David but Harry was there and did a good job as rear guard."